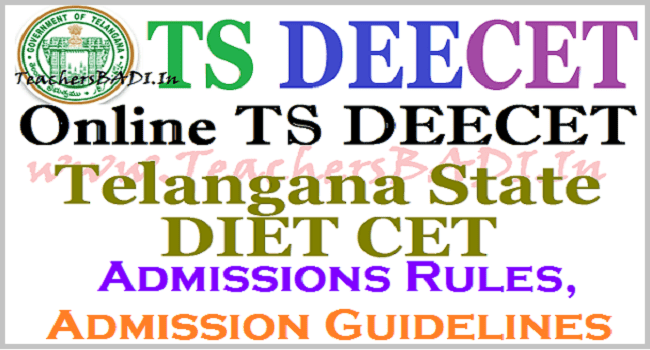 Online TS DEECET(DIETCET) Admissions Rules 2017, Guidelines: Online TS DIETCET Rules 2017, Online TS DEECET Rules 2017, Online TS DEECET Entrance Test Rules 2017, Online Telangana DEECET Guidelines, TS GO.10 Rules for admission into Elementary Teacher Training Institutes / DIETs, DEECET (Diploma in Elementary Education Common Entrance Test) Admissions guidelines, TS DEECET Admission Procedure, TS DEECET Schedule, TS DEECET Admission Rules. Online DEECET/DIETCET Admissions Procedure and Rules, TS D.Ed Course Admission Guidelines. GOVERNMENT OF TELANGANA,School Education Department – Rules relating to admission of students into Elementary Teacher Training Institutions / District Institutes of Education and Training (DIETs) through Common Entrance Test Rules, 2017 – Orders – Issued. 1. O.Ms.No.63,Education (PE-Prog.II) Department, dated 28.10.2013. 5. From the Commissioner & Director of School Education, Telangana, Hyderabad, Rc. No. 38/N1/TE/SCERT/2016, dated 20.02.2017 & 11.04.2017. The following notification shall be published in the extra-ordinary issue of the Telangana Gazette dated 12.04.2017.
i) These rules may be called the Telangana Elementary Teacher Education Institutions/ District Institutes of Education and Training (Regulation of Admissions into Diploma in Elementary Education Programme(D.El.Ed.) through Common Entrance Test) Rules, 2017. (ii) They shall apply to all Government and Private Un-aided Elementary Teacher Education Institutions / District Institutes of Education and Training (DIETs) imparting Diploma in Elementary Education (D.El.Ed.) Programme in the State. (iii) They shall come into force from the academic year 2017-18. (a) “Act’’ means, the Telangana Educational Institutions (Regulation of Admissions and Prohibition of Capitation Fee) Act, 1983 (Act No.5 of 1983). (b) “Chairperson” means, Chairperson of the Diploma in Elementary Education Common Entrance Test (DEECET) and the DEECET Committee. (h) “Convener of DEECET-AC Admissions” means, a person nominated by the Association(s) of Private Unaided Minority Elementary Teacher Education Institutions for selection and allotment of qualified candidates for admission into Category ‘A’ seats of Minority Elementary Teacher Education Institutions that opted for Single Window 2. (k) “Inspecting Authority” means, the Authority / Officer appointed by the Competent Authority for verifying the admissions made in the Private Un- aided Elementary Teacher Education Institutions offering D.El.Ed. Programme. (w) “Single Window-2” means, the Private Un-aided Minority group of Institutions opting for the Single Window System operated by the Convener DEECET AC for admissions into Category ‘A’ seats of their respective institutions from DEECET rank holders. (x) “Category A seats” means, 80% of the sanctioned intake of the seats in all the Private Un-aided Elementary Teacher Education Institutions to be filled by the Convener DEECET or DEECET AC as the case may be from the DEECET rank holders in the order of merit as per the eligibility conditions mentioned in Rule 4 of these rules. (z) “Academic Calendar” means, the Time Table of the activities of the D.El.Ed. Programme with fixed time period and duration for each activity depending on the weightage assigned to the various Programme components to be developed by the Director, SCERT (ii) Words and expression used but not defined in these Rules shall have the same meaning assigned to them in the Telangana Educational Institutions (Regulation of Admissions and Prohibition of Capitation Fee) Act, 1983 (Act No. 5 of 1983). (i) The candidates should be of Indian Nationality and should satisfy the Local / Non Local status requirements as laid down in the Telangana Educational Institutions (Regulation of Admission) Order, 1974 as amended from time to time for admission into all seats in Government DIETs, Government Elementary Teacher Education Institutions and Category A seats in Private Un-aided Non-Minority and Private Un-aided Minority Elementary Teacher Education Institutions. (iii) below. For obtaining a rank, candidate belonging to “OC” and “BC” Communities shall secure 35% marks in DEECET. For Scheduled Castes and Scheduled Tribes there shall be no minimum qualifying marks for allotment of seats reserved under the respective categories. That is to say, candidates belonging to Scheduled Castes and Scheduled Tribes Communities should secure 35% of marks for consideration against seats under OC/ NCC / Defence Personnel or their children and spouses / Sports category. (iii) Educational Qualifications: For all seats in all Government DIETs / Elementary Teacher Education Institutions: (a) The candidate should have passed or appeared for the Intermediate Examination (Qualifying Exam) or its equivalent as decided by the DEECET Committee for appearing at the DEECET. However, she / he should have passed the qualifying examination by the time of admission (b) The candidates should have secured 50% of marks in aggregate in the Qualifying Examination for appearing at the DEECET. The minimum percentage of marks in the case of Scheduled Castes and Scheduled Tribes and Physically Challenged candidates shall however be 45%. The candidates who passed Intermediate with Vocational Courses are not eligible for appearing at DEECET. (iv) Candidates should have completed 17 years of age as on 1st September of the year of admission. There shall be no upper age limit for admission into D.El.Ed Programme. (1) The admissions into all Government DIETs, Government Elementary Teacher Education Institutions and Category ‘A’ seats of the Private Unaided Elementary Teacher Education Institutions shall be made through a Single Window System in the order of merit on the basis of medium-wise rank assigned in DEECET and to the extent of sanctioned seats through Web Based Admission Service provided by the Convener DEECET or Convener DEECET AC as the case may be. The candidates opting for any particular medium shall exercise their option in the online application for appearing for DEECET and the Test Paper for DEECET shall be in that particular Medium only. (a) All the Category A seats shall be filled by admitting the candidates as allotted by the Convener DEECET in case of Private Un-aided Non- Minority institutions and in case of Private Un-aided Minority Institutions by the Convener of DEECET/ DEECET-AC depending upon the option exercised by the Institutions and as per the Rules applicable as laid down in Rule 6 and Rule 7 below (b) All the category B seats shall be filled by the respective Institutions with the eligible candidates as per Rule 4 given above. Admissions under B Category shall be done duly following the procedure laid down in Rule 6 (V) of these Rules. III. The Commissioner & Director of School Education shall issue a Notification in at least three leading News Papers covering Telugu, English and Urdu languages at least Two weeks before the issue of Notification of DEECET for any particular year, inviting the managements of all - Private Un-aided Minority Institutions to exercise their option for admission by the Convener, DEECET admissions (SW-1) or the Convener DEECET-AC admissions (SW-2). The willing managements of Private Un- aided Minority D.El.Ed. Colleges having valid Minority Status Certificates and willing to opt for SW-II shall submit the option within the prescribed time along with the copies of Certificates to the Commissioner & Director of School Education. Private Un-aided Non-Minority and Private Un-aided Minority institutions to exercise their option for Telugu or Urdu or English medium. The option of the managements shall be submitted in an Affidavit to the Commissioner & Director of School Education within the prescribed time. The Managements shall also indicate that they shall provide the instructional facilities for that particular medium as per the Norms prescribed by NCTE for the D.El.Ed. Programme. (v) The Convener, DEECET admissions shall adopt computerized single window system of counselling by way of web based selection of colleges. The Convener DEECET shall prepare the medium-wise seat matrix of all seats in Government DIETs, Government Elementary Teacher Education Institutions, Category ‘A’ seats in Private Un- aided Non-Minority Colleges and Category ‘A’ seats in Private Un- aided Minority Colleges that opted for SW1 in conformity with Rule- 7. (vi) The Convener, DEECET shall make all the necessary arrangements i.e., Identifying the agency through which online examination and web based admission procedure may be carried including Fee collection, venues for verification of Certificates, drawing of Verification Officers etc. in consultation with the DEECET Committee. (viii) The Convener, DEECET shall provide online service for web based selection and submission of order of preference of colleges by the candidates. Allotment of seats shall be made based on the order of merit assigned in the DEECET by following the rules of Reservation as shown in Rule 7 hereunder provided that in respect of Private Un- aided Minority Colleges, seats shall be allotted only to the eligible candidates belonging to the concerned Minority Community only. The Verification Officer shall confirm the Minority Status of the candidate as defined at Rule 2 (i)(r) above. (x) The allotment of seats shall be done separately for each medium and on the basis of merit as per rank obtained in DEECET subject to the condition that the candidate should have passed the qualifying examination with the prescribed percentage of marks as per Rule 4 of these Rules. However, mere appearance at the entrance test and securing a rank does not entitle any candidate to be considered for admission automatically into any institution unless she/he satisfies the Rules and Regulations of admission prescribed in these Rules. (xiii) In case of Private Un-aided Non-minority institutions and Private Un- aided Minority Institutions that opted for SW1 after the first two phases of admission, for left over seats or seats falling vacant due to non-reporting of the candidates to the institution allotted within the specified time on the Final Admission Letter, the Convener DEECET shall notify a last date giving 7 days time for the colleges to approach for allotment of candidates in place of non-reporting candidates. The Convener, DEECET shall fix a schedule and conduct “Left over and Non-Reported Admission” process inviting the candidates qualified in DEECET to submit their options from any of the DIETs through online service provided to the Principal of DIET. Admission letters to such candidates shall be issued as per the order of merit provided that all other eligibility criteria are fulfilled and subject to availability of seats. During this phase the Private Un-aided Minority Institutions shall be allowed to fill up the vacant seats with ‘General’ candidates provided that the ‘General’ candidates do not exceed the 30% limit prescribed in G.O.Ms.No.1 Minorities Welfare Department dated 16-01-2004. and amendments from time to time. Seats falling vacant after such date shall remain vacant for that year. (xiv) In any case, the management of any institution is not permitted to take candidates on its own to fill the non-reporting or left over seats within or after the time fixed for admissions by the Convener DEECET. (i) A Committee for DEECET-AC Admission shall be constituted by the Association of Minority Colleges that have opted for SW-2 to nominate and advise the Convener, DEECET-AC in the matter relating to admission and on such other matters necessary for the smooth conduct of admissions. Such Committee shall have one nominee as nominated by the Convener, DEECET. The formation of such Committee shall be informed to the Competent Authority by the Convener of DEECET-AC. It shall be the responsibility of the Convener of DEECET-AC to ensure the attendance of the nominee in its meetings. The Convener of DEECET-AC shall be responsible for completing the Admission Procedure as per Rules and for submitting timely, all the reports required by the Competent Authority. (iii) The Convener of DEECET-AC shall prepare the schedule and issue notification for web-based admissions in at least 3 leading newspapers one each in Telugu, English and Urdu along with hosting of the schedule and all other necessary details on the official website of DEECET at least 7 days before commencement of taking web-based options (Order of Preference of Colleges for allotment of Seat) from the candidates. The decision of the DEECET AC Committee shall be final for issuing notification, the schedule and the procedure of admissions. (vi) Web based preference of colleges shall be taken from the candidates whose certificates are verified and found to be satisfactory by the Principal of DIET concerned and belonging to the concerned Minority Community only through online service provided for the purpose. Allotment of seat shall be made in the order of merit assigned to them in DEECET maintaining the reservation of seats as specified in A.P. Educational Institutions (Regulations and Admissions) Order, 1974 as subsequently amended as given in Rule 7 (i) Provided that in respect of Minority Colleges, seats shall be allotted only to the eligible candidates belonging to the concerned Minority Community only. The Verification Officer shall confirm the Minority Status of the candidate as defined at Rule 2 (i) (r) above. (viii) The allotment of seats shall be done separately for each medium and on the basis of merit as per the rank obtained in DEECET subject to the condition that the candidate should have passed the qualifying examination with the prescribed percentage of marks as per Rule 4 of these Rules However, mere appearance at the entrance test and securing a rank does not entitle any candidate to be considered for admission automatically into any institution unless she/he satisfies the Rules and Regulations of admission prescribed in these Rules. (x) The Convener, DEECET-AC shall conduct counselling in Two Phases for filling up the Category ‘A’ seats (80% of the sanctioned intake) with Minority Qualified candidates only. (xi) In two phases of admissions for item (x) rule 6, sub-rule (B) above, if 70% of Minority candidates are admitted, the remaining 30% seats shall be filled with Non-minority candidates who are qualified in DEECET. In case, in two phases of Minority counseling, if any college does not fill up the seats with 70% of Minority candidates, the left over seats out of this 70% shall be kept vacant for that year and the remaining 30% shall be filled with Non-minority qualified candidates in DEECET. (xii) The Convener, DEECET-AC shall notify a last date giving 7 days’ time for the colleges to approach for allotment of candidates in place of non-reporting candidates. The Convener, DEECET-AC shall fix a schedule and conduct “Left over and Non-reported Admission” process online inviting the candidates qualified in DEECET and belonging to other than the concerned Minority also to submit their options from any of the DIETs through online service provided to the Principal of DIET. Admission letters to such candidates shall be issued ‘online’ as per the order of merit provided that all other eligibility criteria are fulfilled and subject to availability of seats. (xiii) In any case, the management of any institution is not permitted to take candidates on its own to fill the non-reporting or left over seats within or after the time fixed for admissions by the Convener DEECET. (e) submit the List of candidates after verification by the Principal DIET concerned to the Convener DEECET for approval (ii) The Convener DEECET shall send the approved List of candidates admitted under Category B seats by the institutions to the Director, SCERT, TS, Director, Government Examinations, TS, and the Principals of the DIETs concerned and to the respective institutions. VI. The Convener DEECET shall obtain the list of admitted candidates under Category A of SW-2 institutions from the Convener DEECET-AC and shall transfer the database of all the admissions made for the academic year i. Candidates admitted to Government DIETs, Government Elementary Teacher Education Institutions, Category A seats and Category B seats of all Private Un- aided Non-Minority and Private Un-aided Minority Institutions to the Director, Government Examinations, TS, Director, SCERT, TS, all the Principals of the DIETs in the State and to the respective institutions. The College-wise list of candidates shall be placed on the official website of the DEECET for Two years i.e. the duration of the Programme. (A) Local Areas Means: The part of the State comprising the erstwhile districts of Adilabad, Hyderabad (including Twin cities) Ranga Reddy, Karimnagar, Khammam, Medak, Mahabubnagar, Nalgonda, Nizamabad and Warangal shall be regarded as the Local Area for the purpose of admission into D.El.Ed. All seats in Government DIETs, Government Elementary Teacher Education Institutions, Private Un-aided Elementary Teacher Educational Institutions offering D.El.Ed. Programme shall be reserved in favour of SC / ST / BC as follows: (a) 15% of seats in each course in each institution shall be reserved for the candidates belonging to Scheduled Castes. (b) 6% of seats in each course in each Institution shall be reserved for the candidates belonging to the Scheduled Tribes. The seats reserved for Scheduled Tribes shall be made available to Scheduled Castes and Vice-versa, if qualified candidates are not available in the category. If qualified candidate belonging to Scheduled Castes and Scheduled Tribes Communities are not available the left over seats reserved, for them shall be treated as unreserved seats and shall be filled by the candidates of General pool. (c) 29% of seats in each course in each institution shall be reserved for the candidates belonging to the Backward Classes and shall be allocated among the five groups of Backward Classes as shown below: GROUP ‘A’ - 7% GROUP ‘B’ - 10% GROUP ‘C’ - 1% GROUP ‘D’ - 7% GROUP ‘E’ - 4% If qualified candidates belonging to Backward Class of a particular group are not available, the leftover seats can be adjusted for the candidates of next group. Even after doing this exercise, if qualified candidates belonging to Backward Classes are not available to fill up the 29% seats reserved for them, the left over seats shall be treated as unreserved and shall be filled up with candidates of General pool. (d) No candidate seeking reservation for admission under the above categories be allowed to participate in the counselling for admission unless he produces the Integrated Community Certificate prescribed by the Govt., and issued by the Revenue Authorities in the Government vide G.O.Ms.No.58, Social Welfare (1), Dept., dated: 12-5-1997) as adapted vide G.O.MS. No. 5, Schedule Casts Development (POA.A2) Department, dated 08.08.2014 as amended from time to time. (iii) Seats shall also be reserved in each course of an institution, for the following categories, to the extent indicated against them. (1) Reservation of seats for Physically Handicapped persons: Physically Handicapped (PH) - There shall be 3% (three percent) horizontal reservation in each category (OC, BC, SC, ST) for Visually handicapped / hearing impaired / Orthopedically Handicapped (each 1%) (one percent.) (2) Reservation of seats for the Defence Personnel or their children and spouses: 2% (Two percent) of the available seats in each institution shall be reserved (horizontal) for the Ex-servicemen, Defence Personnel, Border Security Force and Central Reserved Police Force who are Domiciled in Telangana State based on the Permanent address / Home town declared by them while joining the service and as recorded in their Service Register or their children and spouses. (3) Horizontal Reservation of seats for NCC / Scouts and Guides / Sports Candidates (a) National Cadet Corps (NCC) - there shall be ½% (half percent) reservation for National Cadet Corps candidates. (b) In Case of Scouts and Guides ½ % (Half percent) of seats are reserved for Rashtrapati Awardee Scouts and Guides only. (c) Sports and Games - There shall be ½ % (half percent) reservation for Sports and Games candidates: Provided if qualified candidates belonging to Defence Personnel or their children and spouses / NCC/ Sports and Games / Scouts and Guides categories are not available, the left over seats shall be filled up with candidates of General pool of the same local area. Note: The candidates claiming reservation benefits under the above categories shall produce original documents in support of their claim to the Convener of Admissions and the Convener of Admissions shall be entitled to refer the original documents of the candidates claiming reservation for scrutiny and confirmation, to the following authorities. (i) NCC - The Director of NCC, Telangana State (ii) Sports &Games - The Vice-Chairman and Managing Director, Sports Authority of Telangana State (SATS). (iii) Physically Handicapped (iv) Defence Personnel etc. - The Director, Medical &Health Services, Telangana State. - The Director, Sainik Welfare Board, Telangana State. The priorities in respect of the special categories mentioned above shall be in accordance with Government Orders issued from time to time. (4) Reservation for Women: There shall be a reservation (Horizontal reservation) of 33 1/3% of seats in favour of Women candidates in each category (OC/SC/ST/BC/PH/ NCC /Defence Personnel or their children and spouses /Sports and Games) The above reservation shall not be applicable if women candidates selected on merit in each category exceeds 33 1/3%. If sufficient number of women candidates are not available in the respective categories those seats shall be filled up with the men candidates of the same category, (5) Reservation of seats for the candidates sponsored by Other State Government/ Union Territories. One seat over and above intake capacity shall be reserved for the candidates sponsored by other State Government / Union Territories for admission into two years D.Ed., course where there are Telugu Medium schools and do not have facilities of DIETs in Telugu medium. Such seat shall be given in the Government DIET, Mahabubnagar in the State without any reference to the DEECET on reciprocal basis. Ranks shall be assigned to all the candidates medium wise as per the marks obtained in descending order i.e assigning of Rank 1 to the candidate who scored highest marks followed by subsequent ranks to those who follow next in the marks secured. In case of tie in the marks the following criteria should be followed for assigning ranks. For the purpose of deciding the inter-se merit / rank of candidates with equal marks, the following procedure shall be followed in that order: (a) Date of Birth: The elder candidate will be given higher rank over a younger candidate; (b) If the Date of Birth is also same, but the candidates belong to different genders, a female candidate will be given a higher rank over a male candidate; (c) If two or more candidates have same date of birth, and no female candidate is one among them, or more than one female candidates are available, then candidates belonging to the following communities (in that order) shall be given a higher rank: (a) ST (b) SC (c) BC (A) (d) BC (B) (e) BC (C) (f) BC (D) (g) BC (E) and (h) OC (d) In case of further equality or tie, the date of passing of qualifying examination (Intermediate or its equivalent) followed by the percentage of marks secured in the qualifying examination shall be taken into consideration. (1) The Chairperson, DEECET Committee should by convening a meeting of the DEECET Committee draw a schedule such that the following dates fixed by the Honourable Supreme Court of India are adhered to: (2) All the applications filed and received by the Chairperson for Affiliation Committee for granting affiliation for that year shall be disposed before the above said date. (a) The DEECET Committee shall recommend the ‘Fee’ and the ‘Manner of collecting the Fee’ for the online test of DEECET and for the web based counseling from the candidates opting for SW-1 colleges and submit to the Government for approval. (a) The DEECET AC Committee shall recommend the ‘Fee’ and the ‘Manner of collecting the Fee’ for web based counseling from the candidates opting for SW-2 colleges and submit to the Government for approval. (b) The Convener, DEECET AC shall collect D.El.Ed. Programme fee from the candidates who are given admission under SW 2 as prescribed by the Government from time to time and transfer the amounts to the colleges within two weeks after closure of the admissions. In case, irregular admissions are made without following the admission rules, the following action shall be initiated by the Competent Authority against the Principal / Correspondent of the College: (i) Penal action as per section 9 and 10 of the Telangana Educational Institutions (Regulation of Admissions and Prohibition of Capitation Fee) Act, 1983 (Act No. 5 of 1983). (ii) Recommend to the National Council for Teacher Education and Affiliation Authority to take appropriate action under relevant rules for Withdrawal of Recognition / Affiliation respectively. (iii) Refer to the Minority Welfare Department for taking appropriate action in case of Minority Institutions as per G.O.Ms.No.1, Minorities Welfare Department, dated 16-1-2004.